I followed the recipe provided for the pancakes, with one change. I replaced half the AP flour with Atta flour. I also followed the recipe for the sauce as is. For the Moo Shu itself, I began with dry roasting the tofu, then marinading it. 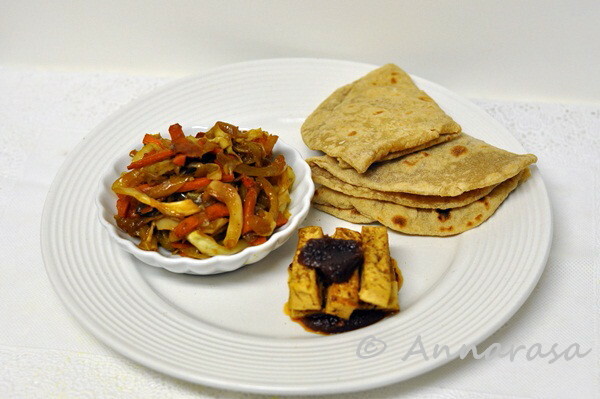 The vegetable is a medley of cabbage, carrots, onions, green peppers, and green chilies. The end product was yum!! This was a great challenge, not at all difficult, and tasty to boot!! A keeper once again from the Daring Cooks!! The recipe to my version below. In a large mixing bowl, blend together the soy sauce, rice wine, vinegar, and one tablespoon of the sesame oil. Season with salt and pepper. This is the marinade for the tofu and the sauce for the vegetables. Cut or cube the tofu as desired. Dry roast on a non-stick pan on an even medium heat. Drop into the marinade. Let sit for an hour at least. Remove tofu from marinade. Set aside. In a wok, pour in the remaining sesame oil. Heat, the add the onions. Fry till transparent, then add the green chilies, the green pepper, garlic powder and the carrots. Stir fry on a medium heat till the carrots just begin to cook, then add the cabbage. Stir and cook till the cabbage begins to wilt. Stir in the leftover marinade and cook till all the liquid begins to dry out. Check for seasoning, add the tofu, turn off the heat. Ladle the Moo Shu Tofu onto the centre of the prepared pancakes. Top with Hoisin Sauce. Post Script: The October Daring Cooks' Challenge was hosted by Shelley of C Mom Cook and her sister Ruth of The Crafts of Mommyhood. They challenged us to bring a taste of the East into our home kitchens by making our own Moo Shu, including thin pancakes, stir fry and sauce. Click here for the Complete October 2011 Daring Cooks Challenge. thofu and sauce looks yummy ,,gr8 pics..
Never knew there is something similar to roti bhaji in chinese. Nice one.